The Japanese tech manufacturer, Sony, has apparently added a new portable computer, dubbed as the SVE11113FXB, to its Vaio E Series. The mini-laptop is based on AMD’s Brazos 2.0 platform and is now available for purchase on Amazon.com, priced at $450. 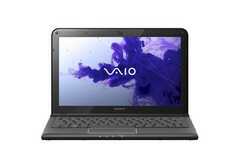 The product page indicates Sony's latest light and thin netbook is suitable for everyday computing being powered by an AMD E2-1800 APU (accelerated processing unit). Codenamed Zacate, this chip houses two cores clocked at 1.7GHz and the integrated AMD Radeon HD 7340 graphics card. Furthermore, the device is outfitted with an 11.6-inch LED-backlit widescreen display of HD native resolution (1366-by-768 pixels) and comes loaded with Sony’s Rapid Wake technology for fast resume times. Reportedly, users will also be provided with up to 8 gigs of internal 1333MHz DDR3 RAM (4GB standard), a 500GB hard drive rotating at 5400RPM and a 64-bit Windows 7 Home Premium operating system. The Vaio E SVE11113FXB is stacked with two USB 2.0 ports and one USB 3.0 port, VGA output, an HDMI interface and a 1.3MP web camera for video conferencing. According to the maker, this mini-notebook features Atheros WB225 802.11 b/g/n and Bluetooth 4.0+HS radios.